Today is the first day of our first attempt at joining a farm share. There are only 2 of us so we went with the small share. Right off my husband was disappointed in the lack of eggplant and I could not help but feel we got a token amount of the grapefruit, kale, lemon and strawberries at best. We have the most onions of anything and I don't like onions. Again, we did order the small share but at $30+ a week I guess I had expected it to not be quite so small. I emailed the farm share that my husband was disappointed in the lack of the promised eggplant as it is his favorite and would there be eggplant in the future? They responded that it is difficult to predict how much produce they need the first week since many people sign up at the last minute so 14 boxes got different supplies than the rest and we must have been one of them. They said there would most likely be eggplant in the future, they gave us lots of lovely bok choy and we would not have to worry about things spoiling. Basically, it sounds like they ran out of stuff and we got what was left. But hey, now we don't have to worry about any veggies going bad! How kind of them. Week 1 so far off to a poor start in my opinion. 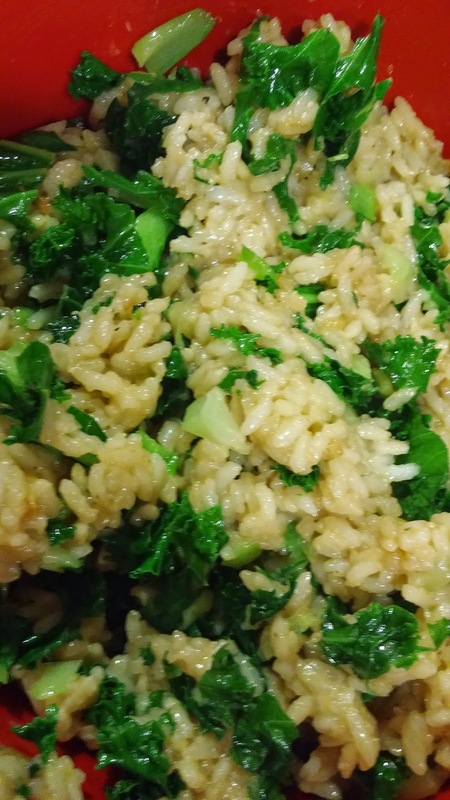 We did have the bok choy/kale stir fried rice for dinner. Here is a picture of the finished product. I burned the first batch of garlic that it required. They are not kidding about it only taking a few seconds to cook. I tossed that one out and started over. The final result was not bad. It was all I had made for dinner. It made enough for one serving for me and two for my husband. No leftovers. It was very chewy as both the kale and the bok choy seem to be chewy vegetables and it was very garlicy. I would do it again but I would cut back on the garlic. I would also think about adding some protein like chicken (and I would watch the pot better).